Last year Brass Monkey racing entered World Challenge with a pair of nearly stock Nissan GT-R's. They ran into some issues with the short development time they had for the car, ending their season after five of the twelve races. After making several changes, and doing testing in the off season, they are back for the 2011 World Challenge season. The season starts this weekend in St. Petersburg, Florida. The races are able to be viewed via online feed starting at 11.55 am Eastern, Saturday March 26th, and 4:35 pm Sunday March 27th Eastern on www.world-challengeTV.com. After missing the second half of the 2010 World Challenge season, Brass Monkey Racing returns with a vengeance in 2011 with its pair of Nissan GT-Rs. The Pirelli World Challenge season starts March 25-27 at the Honda Grand Prix of St. Petersburg, in Florida. 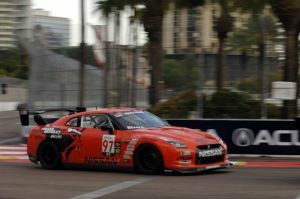 Brass Monkey introduced the Nissan GT-R to North American racing in 2010, but the season was cut short after five of 12 races; the team electing to focus the rest of the year on development for 2011. The team expects that development will put its pair of orange GT-Rs at the front of the field, battling for race wins, the Manufacturers' Championship and the Driver’s Championship with pilots Tony Rivera and Steve Ott. Rivera returns for this third season of World Challenge competition. He was the breakout star of the 2009 season, winning his first-career race (Sebring) and adding another victory (Road America) en route to a third-place finish in the Championship driving a Porsche. He will again pilot the #97 Brass Monkey Racing Nissan. Ott, of Houston, Texas, is anxious to get to St. Petersburg. “I’m looking forward to getting back on the track,” Ott said. “It feels like forever since we last raced [Mosport in May 2010] and I’m excited to see how the changes help us stack up against the competition.” The former Continental Tire and Atlantic Series standout has stayed sharp since May competing in a variety of Club Racing events. Ott will be back in the same, albeit improved, GT-R as 2010, but changes from #96 to #98. Owned by A.J. Brass and located at MSR-Houston in Angleton, Texas, Brass Monkey Racing would like to thank its sponsors for their support, including Nissan North America, Eurotech Industries Inc., Penske Shocks, AMS Performance and Seibon Carbon. For more information, please visit www.brassmonkeyracing.com. Managed by WC Vision and sanctioned by SCCA Pro Racing, the Pirelli World Challenge Championships represent the best production-based racing in the world. Utilizing a single driver format and standing starts for the 50-minute races, the series offers non-stop action in each of its three categories—GT, GTS and Touring Car. The series features 12 races at eight different venues in 2011, starting with a doubleheader weekend at the Honda Grand Prix of St. Petersburg in conjunction with the IZOD IndyCar Series, March 25-27. Each race will be broadcast on a tape-delayed basis on Versus, with the St. Pete races airing Saturday, April 9 at 4:30 pm EDT. For more information, visit www.world-challenge.com.